Thank you for your interest in visiting Omaha. Visit Omaha is happy to assist qualified travel media producing editorial coverage about Omaha. To initiate a visit, please complete the media trip request form below. Depending on the nature of the assignment, Visit Omaha can assist with securing accommodations, developing customized itineraries, arranging interviews and providing passes to attractions, cultural venues and other points of interest. Please note that hosting arrangements are provided through the discretion of Visit Omaha and its tourism partners, and are subject to availability. Due to high demand, we request a minimum of three business weeks’ notice for media visits. Every effort will be made to accommodate your date preferences, however it is not guaranteed. Immediately notify Visit Omaha of a change in travel plans. Visit Omaha is not able to provide airfare or ground transportation for your trip. Meals will only be provided when accompanied by a Visit Omaha staff member. By selecting "yes" you are opting to receive promotional/marketing email communications from Visit Omaha at the email address provided above. You may opt-out at any time. Sign up for our Omaha eNewsletter and keep up-to-date on the latest events, festivals, concerts and special offers in Omaha. 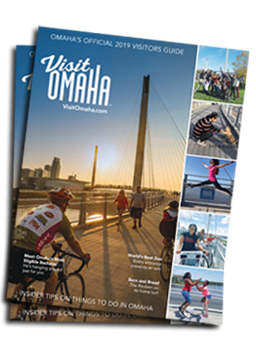 Request your FREE Visitors Guide and start planning your Omaha Weekend!